The National Council of Rural Institutes, under the Ministry of Human Resources Development, Government of India convened a two-day workshop for NSS Co-ordinators of all Central Universities on March 6-7, 2017. 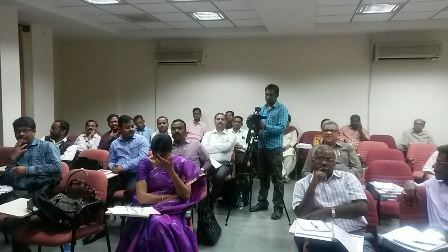 The objective of the workshop was identifying streams of introducing community engagement in the curriculum; preparation of a road map for introducing curriculum on community engagement; brainstorming on the UGC Scheme on Centre for Fostering Social Resposnibility & Community Engagement; reviewing proposals for the same,and finalizing NCRI-NSS plans for Community Engagement. The opening address of the workshop was delivered by Dr W G Prasanna Kumar, Chairman, NCRI. He spoke on various aspects of introduction of rural engagement in the university curriculum. Dr Rajesh Tandon, UNESCO Co-Chair, participated in the workshop as a speaker, and made a presentation on the synergies between NSS objectives and ideologies of Community Engagement. He said that, ‘NSS can serve as the entry of mutually respectful community engagement in HEIs’. He also outlined crisp action points for NSS co-ordinators with respect to designing programs, resource mobilization, building partnerships and ensuring sustainability. In the end, he shared examples of successful community engagement activities that students across several universities around the country have been undertaking in different forms.